In your company, deal, ticket, or quote-based workflows, you can use the Test feature to preview how a specific object will proceed through a workflow once enrolled. If you're using a contact-based workflow, learn more about testing your contact-based workflows. Click the name of a company, deal, ticket, or quote-based workflow or set up a new workflow. In the upper right, click Test. In the right panel, click the Preview for dropdown menu and select an object to enroll. To preview emails included in the workflow, select the Send me the emails this workflow would deliver checkbox. During the test, no actions will be executed for the object. 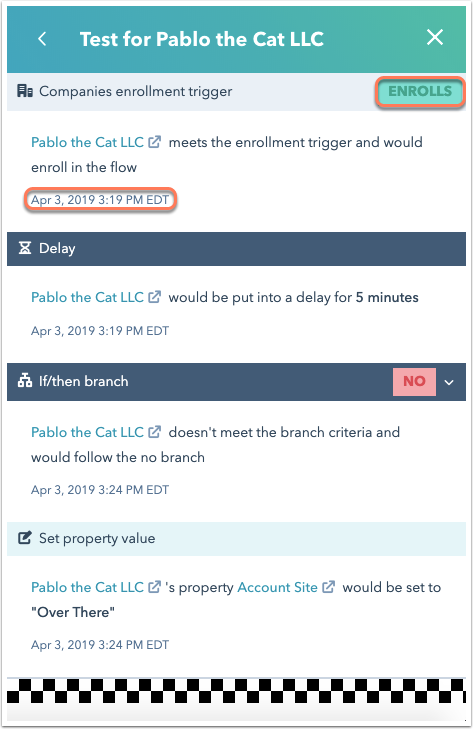 When the test is complete, the right panel will show whether the object meets the enrollment criteria, and the simulated outcome and timestamp of each action. If your workflow includes if/then branches, the right panel will show the branch the object would take. 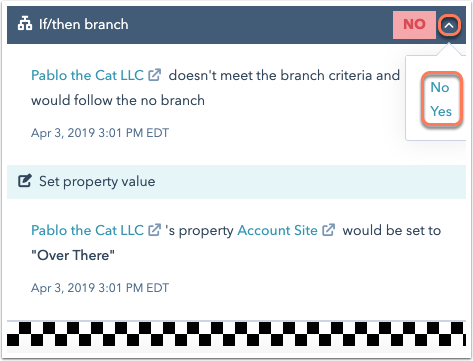 To preview other possible branch outcomes, click the arrow up icon next to a YES or NO label, then select Yes or No.